Back in the day, when I started my first job as a post grad, I wasn’t very focused on the future. If anything, I was still living in the past. I would often pretend I was still in college, which was easy to do since most of my friends had not graduated yet. I can remember a few specific occasions where my performance on the job suffered as a direct result of my lifestyle decisions outside of work. In those early days of my career, I treated my job strictly as a means to an end. That end, unfortunately, was maximizing my enjoyment of life through superficial means and fleeting experiences. I was designing a lifestyle based on momentary pleasures which would not have a sustained impact. My discretionary income was a primary enabler of this lifestyle. Despite all of this, I never lived above my means. I was always good at making sure I didn’t spend more than I earned. I made some foolish decisions, and I developed a few egregious spending patterns. But overall, I was doing ok.
As I progressed through my twenties, I started to take more of an interest in my finances. I always liked numbers, stopping short of being a math major. I found that I enjoyed reading about personal finance. I enjoyed playing around with my own numbers and making sense of them. I enjoyed the idea of optimizing and developing a rock-solid strategy for my money and my future. Little by little, I learned and implemented. I became a self-proclaimed personal finance geek (even though I only proclaimed it to myself). That’s why I wanted to share with you five life-changing lessons I learned on my own journey to financial success. I can tell you that in my personal experience, and in the experience of many friends who I’ve asked, money was not a subject of discussion while growing up. I wasn’t taught about personal finance in school or at home. To this day, it shocks me that such a basic life skill as personal finance goes ignored throughout our education and upbringing. If you ask me, it should be a significant focus to ensure more people have a stable adulthood. A healthy financial life is one of the pillars to a successful, fruitful existence. I spent a lot of time reflecting on the various epiphanies and “aha!” moments I’ve had over the years, and most everything can be distilled into the five lessons here. Think of every dollar you earn as a personal employee, sent to be entirely at your druthers. These little employees have equal power to work for or against you. The choice of how your dollars work for you rests squarely on your shoulders. Would you rather give the dollars a job, or have them scurry right out of your life unaccounted for? Knowing how each dollar you earn is being put to use enables the awareness necessary to take complete control of your finances. This is by far the most fundamental aspect of a solid financial foundation. Without first understanding where your money goes (and why), it’s not possible to claim control of your financial situation. You can’t make intentional financial decisions if you are blind to the big picture. How much do I earn per paycheck? What are my basic monthly living expenses? How much are my monthly utility bills? How much do I spend dining out or at bars? How much do I spend shopping? If you find that the answers are difficult to arrive at, take it as a call to action. Set a goal to track your spending in detail for the next month. Look into your prior month’s bank account or credit card statements. Take some time to parse through and categorize all transactions. There is no shortage of stellar tools and applications available to help you track your spending down to the cent. Tools such as Mint and You Need A Budget (YNAB) have garnered much praise in the personal finance community. If you don’t feel comfortable using an online service like Mint due to privacy, or you don’t feel like paying for a service like YNAB just yet, you can create your own spreadsheets for tracking spending. In addition to using Mint, I have created multiple spreadsheets that I use to track my finances. I never thought I’d actually get excited about spreadsheets, since I always equated them to some mundane-at-best work-related task. When harnessing the power of the spreadsheet for your own financial betterment, it becomes immensely enjoyable. At the most simple level, every dollar you spend is directed into one of two buckets: needs and nice-to-haves. The needs bucket entails all expenses which are required to get through day-to-day life. Housing, food, utility bills, medical expenses, insurance, transportation, basic living needs. The nice-to-haves bucket entails everything else. Dining out, entertainment and cultural events, gadgets and electronics, subscription services, vacations, home decor, and lifestyle upgrades. In today’s society, nice-to-haves are increasingly treated as needs, and this is where things start to fall apart. 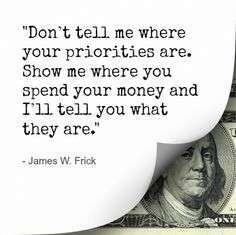 Put your money where your priorities are. When you trick yourself into thinking you need something that doesn’t hold a matching level of personal importance, you do it at the expense of the things that truly matter to you. I used to think I needed the latest iPhone and iPad, that I needed 1,000 square feet of living space to myself, that I needed multiple big screen TVs in my house, that I needed a premium cable package, that I needed to refresh my wardrobe every year, that I needed a steady stream of new furniture and inanimate objects to fill my home, that I needed to go to expensive restaurants and bars in order to sustain a fulfilling social life. When I thought of these things as necessary for the life I wanted, I spent money on them proportional to that assessment. But these things were doing nothing to make me happier. In fact, they only made me feel more suffocated. They served to ensure I would remain in the paycheck-reliant cycle, continuing to find that one more thing to keep me distracted from the day-to-day drudgery. The balance of needs and nice-to-haves in my life had shifted drastically out of my favor. I was a prisoner to the things I thought I needed, and it turns out I didn’t even want them. I’m not advocating for a bare-bones lifestyle focusing strictly on basic needs. I’m not trying to dictate what should make you happy in your life. I am advocating for more individual introspection, to ensure you are minimizing instances wherein the nice-to-haves have been deceivingly disguised as needs in your life. Make no mistake about it: doing the work to restore this needs balance was one of the most important things I have ever done. The concept of paying yourself first is to set money aside for yourself before anything else is done with it. Before the bills are paid, before the grocery cart is meandered through the aisles, before your retail therapy hunger pang strikes. Before it even hits your checking account. Once you have identified your spending patterns and adjusted for your actual needs and wants, you will find that you now have a much more exact understanding of what your true cost of living is. Therefore, you will now be able to accurately calculate how much money is left to pay yourself first with each paycheck. It’s time to set up a system to automatically deposit some money into a safe location where it is beyond the whims of your spontaneous desires. Ideally, this is a location that will eventually allow your money to compound, earning more money automatically (but that is for another day entirely). To pay yourself first, all you need is a savings account, and an ability to set up automatic direct deposit through your employer. To truly understand the power of paying yourself first, a perfect storm of understanding needs to have taken place. You understand that paying yourself first opens up an array of possibilities for the future. Maybe an exciting new business opportunity appears, but you must assume some financial risk. You won’t be able to take that chance if you don’t have a safety net. Maybe your significant other just got an offer for his/her dream job, but it’s on the other side of the country. You want to drop everything, go with your SO, and start fresh. Having a nice stash will allow you to embrace this life change with some time to figure out the next step. Maybe you want to quit working entirely and break any reliance on a paycheck for the remainder of your life. You understand that paying yourself first allows you to live more freely on a day-to-day basis. It’s amazing how quickly the feeling of helplessness washes away when you are intentional about building a better future. You will start to realize that you have choices, you aren’t a slave to your paycheck, and you aren’t a slave to the stuff you never wanted to begin with. With this realization will come a much more optimistic attitude. Daily life starts to get better, and it happens much quicker than you might expect. You understand that paying yourself first is a crucial way to get the most bang for your buck. Compound interest, dividends, 401k matching, stock market growth. All ways for your money to grow as if growing was its sole purpose for existence. Another way to think about it: the complete opposite of what happens to your money as soon as that new car is driven out of the dealership. The concept of setting aside money for the future is foreign to many people. I’ve been there. I steadfastly refused to pay attention to my 401k for at least a year after I started working, leaving thousands of dollars of free money on the table (my first employer offered a ridiculously good match). I felt that putting money away would be forgoing life in the present moment. What I was failing to realize is that nothing I bought could be better than building myself a better future. If you ever hear anything like this, pause and acknowledge that you have just been bestowed upon the ever-dangerous mentality that money is only good for spending. This is the entitlement mentality. It is a natural phenomenon that arises as a result of working hard, and feeling a reward is deserved. There’s nothing inherently wrong with desiring a reward for hard work. The problem arises when it is applied as if the only thing you can do to reward yourself is to promptly spend money, and when this mentality becomes a habit that is applied liberally. As already discussed, paying yourself first is quite possibly the most rewarding thing that you can do with your money. Ignoring the potential to pay yourself first is the worst thing that you can do with your money, and the entitlement mentality is a direct obstacle to paying yourself first. This all goes hand-in-hand with the previous two items in this article, but I thought it deserved its own bullet point because it is so important. Understanding the concepts of reducing expenses and setting money aside is all well and good, but changing the psychology of how you view money to begin with is key to implementing those philosophies and will allow you to accelerate towards financial goals even faster. Otherwise, it becomes dangerously easy to simply say “I’ll start saving tomorrow”. And we know how that will probably work out. It’s funny how seemingly trivial moments in life tend to stick out in your memory for years. I have a few such memories from various points on my path to turning my financial life around. I remember one of the first major epiphanies I ever had with budgeting. I was on a flight home after an especially enjoyable overseas vacation, mentally refreshed and motivated. Dreading my impending return to the beige walls of cubicle nation, I whipped out my laptop and came up with a rudimentary savings plan that I was immensely proud of. Seeing the numbers on the screen made everything click for me, and I knew I was going to implement the plan successfully. From that day forward, I knew I was in control of my own future. I was never quite as sure of it before then. I still have the document saved in all of its plaintext glory, and reflecting back on it shows just how much progress I have made since the day I typed those numbers from my seat on the plane. It reminds where I came from, but also keeps me motivated on where I am going. Along your own path to financial success, you will likely have similar experiences. The key is to realize that no matter how much progress has been made, it takes a relentless mentality to continue pushing forward and improving. There is always room for improvement. I have been improving my own plan since I started, and I don’t intend to stop. Years from now, I will reflect on where I am right now and consider just how far I’ve come since today. It is also important to realize that the only worthwhile comparison is that of comparing your current self to your past self. Everyone is on their own journey, and it’s important not to get caught in the trap of comparing yourself to others. You can look to others for inspiration and motivation — in fact, becoming inspired by others might be the most powerful component of building your own success. However, you must do your best to ensure this doesn’t turn to comparison. No matter where you are on the path, there are plenty of people well behind you and plenty of people well ahead. The only thing that matters is that you are moving yourself forward with each passing day. The process of gaining control of your finances may seem daunting and overwhelming. Analysis paralysis may stop you from attempting to reverse adverse trends and patterns in your life. With the bevy of personal finance information, tools, and resources available on the internet, it can be impossible to know where to start. I hope some of the ideas shared in this article help to lay out a clear path to taking action. Personal finance always seemed like an overwhelming subject for me, so I kept pushing it off to the future. I remember receiving my first paycheck and feeling incredibly confused by the taxes and amount going to social security, etc. As a result, I did little to truly understand where my money was going and as a result barely saved anything. I was lucky to already have a savings cushion which unfortunately, acted more as a safety blanket and less as a means to enable me to feel confident with my money. It took me a long time to have a healthy relationship with money and to not view personal finance as intimidating or stressful. It also took a lot of work to organize my finances, understand where I was spending my money, and eventually start saving money every paycheck. I don’t feel like I know everything about personal finance but I do feel more confident in my ability to understand many of the lessons you touch upon. Being able to ask yourself the tough questions you propose in the blog is a great first step for anyone interested in wanting to have a better relationship with their money. You don’t need to be rich or poor, young or old to feel empowered by personal finance. Most people I know work incredibly hard for their money and live paycheck to paycheck. Some of that is the result of institutionalized discrimination, low-wage jobs with little benefits, and the “gig” economy (http://www.politico.com/magazine/story/2015/09/next-gig-horowitz-uber-213097). Others (like my old self) live paycheck to paycheck due to not understanding or wanting to understand what their money means to them. I feel money and personal finance should be discussed more, especially at a young age. Just as an FYI – many school districts have started implementing personal finance into the curriculum and understand that it is one of the most important life skills you can teach someone (http://www.doverpost.com/article/20150909/NEWS/150909822). It’s great to see this trend of schools breaking the taboo around talking about money. Lastly, I love what you said at the end about not comparing yourself to anyone (except for your old self). I think it’s so easy to compare yourself to others and to feel inadequate because you don’t have X, Y, or Z. What I always come back to when I’m feeling insecure or upset is to look inward and remind myself of my own personal values and what is truly important to me. This may seem a little hippy-dippy but a lot of the time I’m not upset about the thing that I don’t have or want but more about the deeper issue of what it means to me. Doing this kind of reflection is easier said than done but I’m looking forward to continuing on this journey. As Annelise’s mother, I can attest that I did little to help her learn the value of managing money. I was never taught at school or at home that “money did not grow on trees” so as a result I lived paycheck to paycheck. I find your maturity Andrew at a young age to focus on these issues very admirable and I am grateful for the help that you have given Annelise to understand how important these issues are to learn ASAP. Every month, I save every receipt and every online payment and then I do nothing to organize all the raw data into a budget. My son downloaded the mint app for me, and I have not used it. I intend to read your blog in great depth and respond, but this is my number one issue and nemesis. This is my 800 lb gorilla that rides beside me and keeps asking me when I intend to deal with this problem. Thank you so much for this blog and for your very succinct analysis on how to tackle this common problem. Thank you and I will be back with a game plan that I intend to implement. However, it has to take a backseat to my trip to Brooklyn to attend a very important wedding. God bless. I know how it is to feel overwhelmed and unsure of where to start, I was in that holding pattern for a long time before I had a few “clicking into place” moments. I hope the info I’m sharing helps! I tried to illustrate what I went through and learned in a way that is easy to make sense of and apply to your own life. I would love to show you some tips/tricks I use next time I see you also. A good primer to personal finance! I was never one to “plan my finances” until college. Instead, I had a “bottom-up” instead. Rather than have the big goal of “saving/investing X at Y period”, I planned for my spending habits to be cheap. So my hobbies ended up being working out, scenic walks, cafes (cheaper compared to other destinations), video games with friends… you get the picture. By making my hobbies cheap or free, I saved a lot of cash. And most of it – when I gained financial literacy – went into investments. I didn’t ever create that craving to spend money…. until AFTER college when I got my full time job. I bought away the stress. Expectations of adult professional life were not as I imagined. I hear you, Aaron. I definitely had a rough adjustment to adult professional life – asking myself “This is it?” all the time, and compensating for that emptiness by trying to buy myself everything I thought I should have. The irony of buying away the stress is that it ensures the stress stays around even longer! Just takes some foresight to figure that pattern out. It is great once you start to notice that the majority of the time, the things which are cheap are actually the most fulfilling. I know it sounds cliche, right? But it’s so true. “The best things in life are free”. We are socialized to reject that cliche and it turns us into consumption robots. I’m not an “all the time” user of cell phones and the like, so I have often found it useful to carry a pocket notebook to record expenses as I go. I just jot ’em down quickly on a new page in my notebook and then add them later to my personal finance program of choice (You Need a Budget). I completely agree that such a system is essential for figuring out where all the money is going. I still find it useful and I’ve been “in control” of my finances for almost a decade now! Hi Trent, thanks for stopping by! Great tips – writing transactions down in a notebook may take some time to form a habit out of, but it is well worth it. It also helps you stop to think about/further comprehend what it is you are buying, which forces intentional purchasing decisions. A very empowering tool indeed!